click,click,click: Place 1 agenda counter on Domestic Sleepers. Now that Exchange of Information exists, this card is the perfect piece to trade for those Mandatory Upgrades that just got stolen. Of course, you have to tag the runner first from HB, which might prove tricky. But hey, that's the price you pay for playing jank. The main benefit of scoring a Domestic Sleepers is this: your opponent goes, "WTF?" They will wonder why you'd include the card and perhaps adjust their play style because of it. 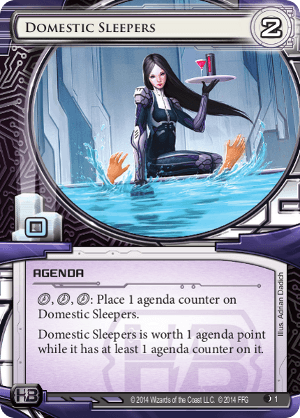 It goes well with fast-advance decks, where you have to score 3/2s, and it makes it so you really only have to score 3 agendas and a Domestic Sleepers in order to win. The same with 5/3 decks; they have to score 3 agendas and you only two. But, if they see you have six points and a DS scored, they're going to go all aggro on R&D/HQ next turn, so look out. As said before, it's good for cards that make you forfeit agendas, like Archer and Corporate Town. But that's about it for DS. Confusing them, having that seventh point, and forfeiting it. Not worth scoring more than one. Hard to include, but fun when you can. So, as noted below most opponents will run like crazy trying to hit HQ and RnD for agendas if you're on match-point with a Domestic Sleepers scored as a 0, knowing that you'll win next turn. And there's been plenty a time when Desperado- I mean desperate runners can get lucky on an access or two. So, how to avoid this? Well, there's 2 possible ways. a) You can install a card in your scoring remote, unadvanced, and then the next turn, activate the Sleepers. Now, they're in the desperate position of either trying to blindly find an agenda in HQ/RnD, or they can run that remote assuming it's your winning agenda. Which it shouldn't be, if you're playing the mind games. This way, you can tax the runner, and then create a scoring window where there might not have been one. b) The other method, one I prefer, is to install+advance+advance into your scoring remote, whether it's an agenda or a trap. If they don't run that server, instead of scoring it, activate the sleepers next turn. Now it's a mind game: Is your advanced card in the server an agenda, or a trap? Some runners will psyche themselves into a do-or-die situation, and if you're playing overwriters/junebugs, walk into a bad situation. Or, they may think the installed card is a trap, and not run there, and either going after centrals, or setting up for a run after you switch out the 'trap'. In which case, you can safely score out from your remote if your card was the agenda. Note that (b) can misfire spectacularly, but is most rewarding if you get them to zig when they should zag. The hardest issue with this card has always been deck slots. There might be a case where you swap this card with Ash 2X3ZB9CY in Glacier HB decks. If you install advance advance this in a big remote, and leave it there, the runner cannot distinguish if is a big 5/3, and may or may not run it. Regardless of whether or not they run it, you can score it and install advance advance your real 5/3 next turn.